It was, in fact, a dark and stormy night. The wind howled and sheets of rain lashed against the mud walls of the Arab cafe. Our camel drivers had arrived just before the rains returned with a vengeance, and inside the cafe we toasted our drivers good fortune as well as our own. While bottles of wine were uncorked, our flamboyant Berber guide began to sing. Arab camel drivers, dressed in bright-blue caftans and black turbans, set the beat with pairs of metal cymbals while we joined in on hide-covered tambourines and drums. Dust rose from the dirt floor of the cafe and produced eerie auras of light around the propane lanterns. As the tempo quickened, our Land Rover drivers began to whirl about the room like Sufi trance dancers. We had begun our day at our campsite in the orange dunes near Remlia Well in southeastern Morocco. It was our second day on the ancient caravan route between Marrakech and Timbuktu, and we had traded in our Land Rovers for the camels that would carry us across the soft sand of the ergs, or dunes, to the Tafilalt capital of Erfoud. We had expected to ride for six hours and cover eighteen miles, but as the day progressed we watched our drivers checking out a cloud of wind-driven sand closing in on us from behind. By midday we were following their lead and wrapping the long tail of our cheches, or turbans, across our noses and mouths to keep out the sand. Our camel drivers didnt seem worried, but we failed to appreciate their Moslem fatalism. To them, events were unfolding as they inevitably must, and in sha allah, God willing, they wouldnt get worse. When our guide spotted our tent up ahead through the swirling sand, she let out a traditional Arab ullualation. The scene was reminiscent of Lawrence of Arabia, and when we returned her cry, our camels shifted into high gear. With no stirrups, I found trotting on a camel painful. Luckily, the tent wasnt far off. While we sat down to a lunch of cooked vegetables, grilled brochettes of lamb, oranges, and tea, a cold driving rain blew in on the heels of the sandstorm. While we ate, our guide and her drivers reviewed our options. Brahim, one of the Land Rover drivers, suggested we seek shelter for the night at a nearby Arab cafe. After lunch we said good-bye to our camel drivers and made for the cafe, slipping and sliding in the Land Rovers across the muddy untracked Sahara. When we arrived, our guide struck a deal with the owner that allowed us to bed down for the night on the long padded benches that lined his cafe. With a deal in place, our cooks took over the owners kitchen and prepared a hearty soup and couscous with lamb and vegetables. The first toast of the evening went to our guide and her drivers, who had given us the adventure of a lifetime while keeping us safe and comfortable. The sand storm that raged outside the cafe had blown itself out by the next morning and left the dark-orange dunes as smooth as pudding. 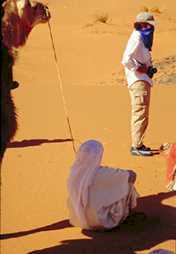 Over the next two days we led our camels up the east side of Erg Chebbi, Moroccos highest and most spectacular dunes. We hadnt seen another tourist since we left Zagora, and with the exception of a few nomads, we hadnt seen anybody. We set up our last camp at the base of Erg Chebbis highest dune. After breakfast we hiked over the 800-foot dune while our camels were led around it to a small oasis on the far side. Slowly, we worked our way up the windward side of the dune to its crest. The view looking back down over the vast sweep of the Sahara seemed to swallow up our rather insignificant caravan. On the other side of the crest our view was all blue sky and orange dunes. From the oasis we led our camels out of the dunes to our lunch stop. While we ate, the sky over Algeria, sixty kilometers to the east, grew as black as coal and dust devils danced across the sands. Back on our camels we made our way to the main north-south, east-west intersection for that part of the Sahara. Where vague tire tracks formed a "+" in the hammada, one white stone among the million black ones proved an adequate street sign. We signaled for a left turn and followed the tracks west to the French cafe, Auberge Yasmina. The last section of dune was the most spectacular, and when we reached the end of the erg we were disappointed to have to bid farewell to our camels and their drivers. Back in the Land Rovers we flew over the desert to Erfoud following tire tracks where we could find them and making our own where we couldnt. After squandering an unfair amount of hot water on our first real shower in days, we were drawn onto the balcony by the roar of car engines. Our hotel was hosting the final leg of Fiats Rallye du Maroc, and while we cheered the finishers, Porsches, Jaguars, Aston-Martins, and Ferraris spun into the hotel courtyard. A stylish finish to the end of a remarkable journey. Jim Yost is a travel writer/photographer who lives in Golden, Colorado. Courtesy: Mountain Travel Sobek [Mountain Travel Sobeks "Morocco Camel Safari" includes visits to palace-filled medieval cities like Marrakesh and F�s. 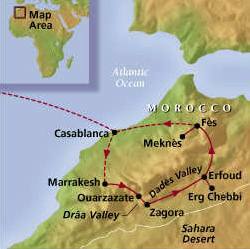 It features a journey by Land Rover on an old Saharan caravan route and visits to colorful Berber villages and souks. 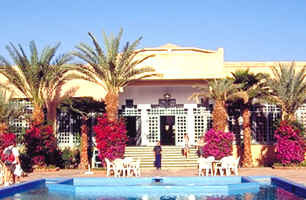 The highlight is an exciting four-day camel safari across the sands of the Sahara, from Zagor to Erfoud].